Rahul and Smita were dating for close to two years. While Rahul preferred routine and normalcy, Smita was against everything that was typical, institutionalised and common. She hated monotony and he saw that as an opportunity to win her heart and pop the question. He invited her over a cosy dinner at his place. His skills in the kitchen came handy and he was able to dish out an awesome Chinese spread — Smita’s favourite. As she was enjoying the meal seated casually in the comfy lounging couch, Kenny G’s soulful renditions played out from the Dolby Digital speakers that Rahul had installed recently, creating the perfect mood. At the end of the dinner, Rahul’s HD television slowly came alive with photos and videos of Smita that he had captured through his iPhone. Before she could have the time to react, he got down on his knees and proposed to her. It was perhaps the first time in her life when Smita agreed to something which was very typical. The word “entertainment” encompasses a wide range of emotions and feelings. For some of us, entertainment is all about having a group of friends and watching a football match live on television, while for others it is all about reliving memories with a beautiful piece of instrumental music gazing at the moonlit sky. Irrespective of your personality, entertainment is all about feeling happy and at peace with yourself. What Type of Home Entertainment Zone are You Looking to Create? If you’re wondering how to create a zone dedicated to fun and relaxation in your apartment, this is the first question you need to ask yourself. A simple set up with a high-definition TV and speakers may be all that you need if you want a modest entertainment corner in your living room. But if you wish to recreate your movie-going experience right inside the comfort of your home, what you probably need is a home theatre. In fact, if you’re willing to invest in your own home theatre system, you’d be floored by choices at every price point in the market these days. Depending on your needs and budget, you can easily find the components to build your own entertainment room. That said, let’s break down some tips which can help you create a home entertainment zone within your budget. Before you start designing, it is important that you decide where you want to set up your entertainment zone. Are you comfortable in using your living room for this purpose or do you prefer using a completely different room? If you have a separate room to spare, it will give you the much-needed privacy and dedicated space. But if you don’t have an extra room, combining the living room with the entertainment room is the most popular option. However, there are no hard-and-fast rules when it comes to turning a room into a functional home entertainment zone. 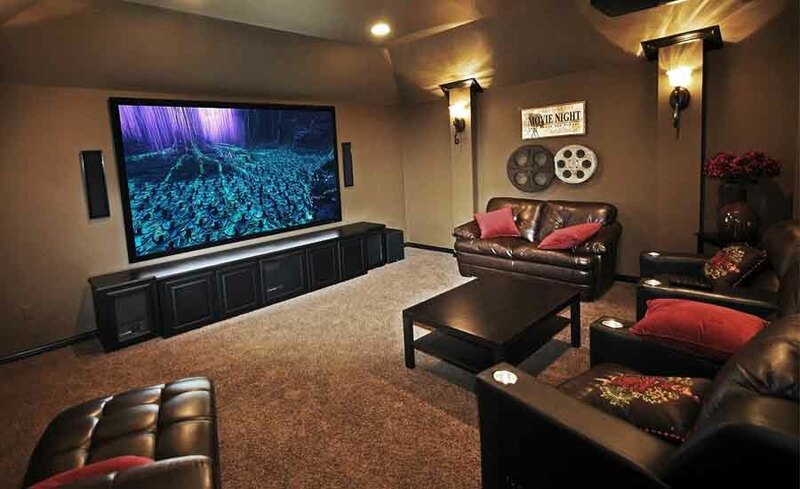 Home theatres typically require a smaller space than a commercial theatre, because then, it is easier to control the sound and manage the acoustic issues. Map out your available space and plan where everything is going to be placed. This TV viewing distance guide will help you understand your optimal viewing distance based on the type of video you’d be watching — e.g. 720p, 1080p, etc. Entertainment rooms at home are meant for relaxing. So it’s important that you invest in high-quality furniture that are both, aesthetically appealing and comfortable. Remember to optimise your room space and maintain a distance of a minimum of 10 feet between the TV screen and your sitting area. Don’t stuff in too much furniture. It takes away that open feeling from the space and can make it less pleasant for your guests. Often, an all-in-one entertainment unit will serve you best if you’re looking to fit a functional entertainment zone in your apartment. You can check out some great options at Amazon and Pepperfry. 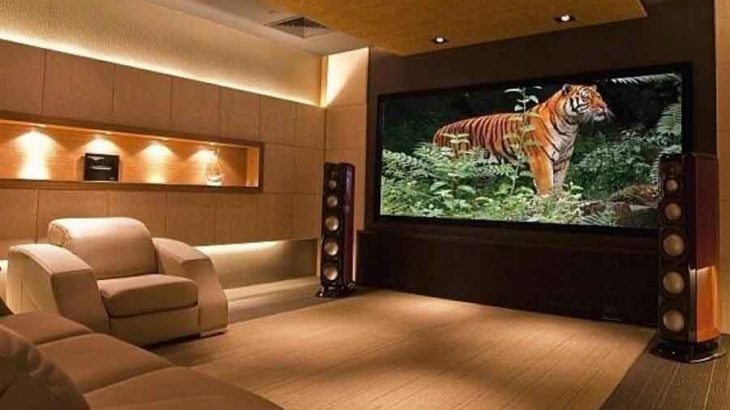 For more elaborate options to outfit your dedicated home theatre space, it is best to contact a home theatre consultant who can build custom solutions for you. TV is an essential part of your home entertainment zone. There are a host of different technologies used by television brands these days, but be careful about what you choose and whether it fits your needs and space. For instance, LED TVs are ideal for rooms with a lot of light, while Plasma TVs are good for darker rooms and offer more viewing angles. There are OLED TVs too, which are slimmer than regular LED TVs and come with better benefits, including a wider viewing angle. Now is also the era of the internet-connected Smart TVs. With so many choices in terms of technologies, features, sizes, and price range, you can easily get baffled while buying a TV for your entertainment zone. Here’s a buying guide that will make things easier for you. Speakers are the heart of any home entertainment system. They are, in fact, the best investment you can make, so it’s best not to cut corners when buying speakers. Surround sound system makes the room come alive with pure digital quality sound. Depending on the size of your room, you could choose a 5.1, 7.1 or 9.1 surround sound. The 5.1 system utilises 5 speakers and one subwoofer, while the 7.1 system uses 7 speakers and one subwoofer. 9.1 is for the most ambitious users who desire a truly cinematic experience through 9 speakers and a subwoofer. But no matter which system you opt for, speaker placement is critical for great sound. Check out this helpful guide from Dolby for some great placement advice. Practical tip: Speakers need a lot of wiring, so it is better to get the wiring in place before plastering your walls if it’s a new apartment. This will help to keep the aesthetics of your room intact. In case you have decided to install a home theatre system after moving into a completed property, you can use wireless speakers. Place these wireless speakers behind your TV or furniture to get the maximum sound effect. Plus, there are many discreet models available that blend in with your room’s décor. Storage is an essential part of the designing process. In your entertainment room, you are likely to have a lot of CDs, old vinyl records, gaming consoles, books, etc. Normally, TV units do come with their own storage spaces. But if you’re looking to create a more personal space that showcases important memorabilia or pictures or even has a mini refrigerator to store your drinks, you need something tailor-made. Pinterest has hordes of cool storage ideas that you can use to get a storage solution custom designed for your home entertainment space. Last but not least, the pulse of the room can be felt in its décor. Use a colour scheme of your choice; get creative with wall designs, but don’t forget that you need to block light and sound reflections to create the right ambiance. You could install soundproof panels in your entertainment room. If you’ve set up an entertainment zone in your apartment’s living space, you could get dark drapes, rungs, and carpets for the same purpose instead of soundproof panels. Creating an awesome home entertainment zone is not all about finding the most expensive gadget. It is about using your imagination and creativity to synchronise everything together to create a place meant for ultimate relaxation.